Bettenroo: What’s in a Name? Truth be told, Lori Jacobs should not have answered that second Craigslist ad. Responding to a first ad for a drummer, she showed up at the designated address, a house where she was meeting strangers, and she was instructed to make her way to the basement. A few red flags should have been raised. However, whether by innocence or a high level of trust in other people, Lori continued to the basement to audition as a drummer in a band, per the Craigslist ad. There were several men waiting for her in the basement, adorned with ZZ Top-style beards, possessing all their teeth. She sat at the drum set and began to audition. Nothing clicked, and Lori went home. The next Craigslist ad for a drummer was similar. “Drummer needed.” Lori took a deep breath and answered that one also. The second time was a charm. Waiting for Lori at this house was Anne Davey, along with a few other band members. Lori arrived, and in a twist of fate, picked up a guitar sitting nearby and began playing. Bettenroo was born. Once in a while in your lifetime you meet someone with whom things just click—in love and in music. This was the case with Anne and Lori initially, for music, then later in love. Bettenroo, a group with a catchy but somewhat mysterious name has been an alluring duo for six years now, with a healthy list of gigs committed for the 2018 season. The paths the musicians traveled to this point were diverse. Lori’s mother raised her without a father figure from age five. When she was twenty-one, she joined the Air Force, came out while in uniform, and served her term. She made her way to Vermont, where she was free to be herself. 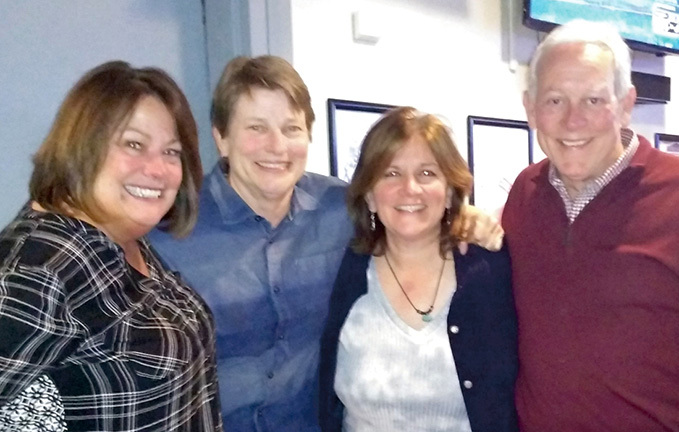 As she shared, “I could be out and it didn’t matter to anyone!” Lori eventually made her way back to her hometown of Allentown, PA, and was adamant she would not go back in the closet. Although raised in a more traditional household, Anne also saw her mother as also a strong influence. Living straight for most of her life in the metropolis of Philadelphia, Anne had an awakening a year into her time with Bettenroo. She found true love with her music partner and new soulmate, Lori. That their mothers were such inspirations to both of them is evidenced by the name “Bettenroo,” a combination of Anne’s mother Betty and Lori’s mother LaRue. Bettenroo is a tribute to both their mothers. When Bettenroo plays, the audience is engaged and enraptured by the precise harmonies that meld together as one voice. Anne and Lori have, as Lori so well understated, a “vocal connection.” Each time they perform, Anne and Lori have no defined set list. From cover rock to original songs, they “go with the flow” as they interact with audiences and adjust their song selections on the spot. It’s a sign of a confident duo, two singers/performers who know themselves and each other. And their inspiration comes from many places. Matthew Tremaine was a man who died at age 43, following a difficult bout with aggressive melanoma. After Matthew’s death, his sister Kris sent her good friend Lori lyrics for a song and asked if Bettenroo could put them to music. The words invoke the image of Matthew singing to his wife. This was a very personal request, holding Anne and Lori to an incredible task. The song that resulted is their free-flowing “If the Day Ever Comes.” Here are some of the lyrics. If the day ever comes. Anne and Lori are gentle souls. They laugh together and enjoy the company of all who want to savor life. Their lives are on display in the lyrics of the songs they have recorded on their first CD, Live Out Loud. A second is in the works. If you are not familiar with Bettenroo, you may find them on their website, bettenroo.com. Look over the schedule and plan an enjoyable evening out listening to the smooth voices of the Bettenroo duo.